My youngest daughter is a delightful ball of energy. She has met all her developmental milestones and she looks cute doing it. But life with our 18 month old is pretty stressful at the moment, because she’s literally sick every other week. My husband and I both work outside the home, and we both have the flexibility to work at home while caring for a sick child. However, we have been asking for that flexibility an excessive amount. It wasn’t surprising when my husband’s boss stopped by for a chat one day. She steered the conversation to her sister, who had twins. With the arrival of the babies, her sister and her brother-in-law had to decide who would work, because they couldn’t afford daycare for two children. However, this was clearly a gentle hint at the amount of flexibility that had been requested. But for us, there’s no decision to make. With student loan payments that outweigh the average American mortgage, we both must work in order to pay our bills and provide for our children. Our student loans are a major impact to our life, even more than 10 years after graduation. Student loans tend to seem like a good idea when you’re 18 and you want the college experience. You convince yourself that it will be no problem to pay off the debt. Once you’re out of school and have a good job, you’ll be making enough money to afford the loan payments, so the loans seem logical. No argument here: if you keep your loan amounts low, make a good salary, and live well within your means, student loans will likely not be very problematic for you. However, student loans will certainly factor in to all your major life milestones. 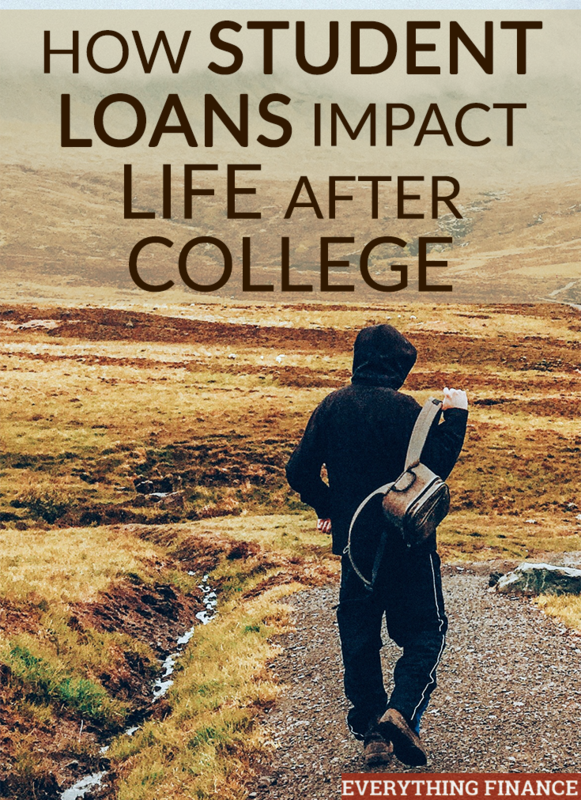 Let’s look at how student loans impact life after college. As a new graduate, one of the first things you might do is look into purchasing a new vehicle. Since you took out student loans, we already know your dad isn’t Warren Buffett, which probably means you’ll need a loan. Your student loans might actually help you get that car via financing. Student loans help you establish a solid credit history as well as raise your credit score – so be sure to pay the loans on time. You’ll need that credit history and decent score in order to get a loan (and good interest rates) for the vehicle. However, loan underwriters will also consider your debt-to-income ratio. If your student loan burden is half your take home pay, you’re going to have a hard time getting a loan. In that case, you might drive your old car a little longer while you pay down your loans. Attacking a large loan and bringing the balance down doesn’t help. You’ll need to lower your monthly payments; attacking the lowest balances first in order to get the most traction might be the better option. Wedding ceremonies are becoming more and more elaborate (and expensive). The average ceremony is now around $30,000! Obviously, you can hold a wedding for much less and your families might be willing to chip in for certain services. If you want a huge ceremony, your student loans will probably constrain your budget enough that you can’t afford every detail in your dream wedding. For that reason, you might be tempted to put some things on a credit card, but fight the urge. If you think student loans cramp your style, try adding in some high interest rate debt! But let’s go beyond the ceremony and examine the relationship. Imagine you graduate from college debt-free and start a promising career in business. You meet the man or woman of your dreams, fall in love, and start thinking about getting married. During your relationship, you’ve seen your loved one struggle with finances and eventually you learn that they have $80,000 in student loan debt and they aren’t even able to find work in their field. That debt might not go in your name when you get married, but it’s still your debt because it will impact your life. Can you buy the house you want? Can you travel like you wanted? Can you afford to have children? If your future spouse has too much debt and not enough income, your income will get sucked into taking care of the debt. You’re young and in love. You don’t have to run screaming the other way just because your future spouse has student loan debt. However, it’s a good idea to make sure you’re on the same page when it comes to debt. If it’s important to you to get rid of the debt before marriage, then be sure to talk about that with your future spouse. In this case, it would be good for them to prove a commitment to paying down their debt. For example, they might hold a job, live on a budget, and pay at least a little extra on their student loans every month. Student loans won’t affect you as you arrive at the hospital or birth center to give birth to your bouncing baby. No one is checking debt-to-income ratios while the mother-to-be screams for an epidural or relaxes using her HypnoBirthing techniques. No one will check your credit as you buy boxes of diapers or buy baby-proofing gear. On the other hand, student loans will impact your life with a baby. Prior to the baby, you and your spouse probably worked. Now, you’ll need to have some sort of care plan for your bundle of joy. Will one of you stay home? Will you both cut back hours? Will you use a daycare or a sitter or a nanny? Student loans are often a dark cloud over all these decisions because your finances end up dictating the decision, leaving no room for what you think is the right choice. While babies don’t need very much, they do need some things, so if you’ve been paying extra on your loans, you might find that this stops. Your student loans will impact buying a home in much the same way that they factored into purchasing a car. The good news is that, if you pay on time, the student loans will bolster your mortgage application. The bad news is that they can factor into the debt-to-income ratio. Regardless, your mortgage officer is bound to tell you that you can qualify for a much more expensive home than you can realistically afford, especially if you have any student loans at a variable rate. You might have a much larger payment in a few years, which might make your home unaffordable. Also, if you intended to pay off your loans early, you’ll have to account for the extra payment in your budget. The mortgage officer isn’t making any allowance for that when you’re prequalified for a loan. It’s a good idea to build your budget and understand the maximum monthly payment that you can make. You can use that to back out a home sales price that makes sense for your situation. Once you’re out of college and working, you should start saving for retirement. It may seem like a long way off, but if you don’t start now, you’ll never reach the finish line. Hopefully your employer offers a 401(k). Contribute at least enough to get the full employer match if one is available. You’ll eventually want to contribute much more than that, but with student loan payments, you might not have enough money to do so. On the bright side, many retirement contributions are done with pre-tax dollars. That might be beneficial to your overall financial situation as it lowers your taxable income. On a darker note, it’s best to invest as much money as possible in the earlier years, taking advantage of the compounding effect of investments. $5 contributed every month, compared to $1 contributed every month, doesn’t sound like a huge difference. Over the course of 40 years, that difference will be tremendous. If you’re paying off student loans for 20 years, you might find yourself with a stunted retirement account in your 40s. It will be tough to catch up to where you should be without discipline and a little luck in the markets. In other words, you might find that student loans have allowed you to have the career you’ve dreamed about. And because of the student loans, you may never be able to afford to stop working! Student loans can be an excellent way to ensure that you finish your college education with a minimum amount of stress. Taking on debt sure beats taking every couple of semesters off to work or working all night shifts in order to pay for the classes that you’ll attend the next morning. On the other hand, the impacts will ripple throughout the rest of your life, possibly impacting other dreams. The best approach is to borrow only the minimum amount necessary and pay it off as quickly as possible. In what ways have your student loans impacted major milestones in your life? Do you regret taking out as much student loan debt as you did, or was it necessary? If you could go back, would you change the way you paid for college? It’s funny that you mention daycare. My student loans are the #1 reason why we can’t afford daycare. Right now I have the option of working from home and my husband works an entirely different shift than I do so we can work. If I had no student loans, this wouldn’t be a problem and I could spend more time with my husband and kids together. However, right now the struggle is real and we will have to do what we have to do to climb off from underneath this debt. I definitely regret taking out $79,000 in student loans and I will do my best to steer my kids away from the same outcome.